Abstract: Highly-bioturbated “spotted” limestones and marls (Fleckenmergel—Fleckenkalk facies) of the Early Jurassic, which were deposited in broad and recurrent deep-shelf habitats of the Northern Tethys, are characterized by rare benthic carbonate-producing macroinvertebrates. To address this paradox, we analyse trace-fossil assemblages in a ~ 85 m-thick succession of Pliensbachian spotted deposits (Zliechov Basin, Western Carpathians). They are dominated by infaunal and semi-infaunal deposit-feeders, with 9 ichnogenera and pyritized tubes of the semi-infaunal foraminifer Bathysiphon, being dominated by Chondrites, Lamellaeichnus (new ichnogenus), and Teichichnus. Lamellaeichnus, represented by a horizon- tal basal cylindrical burrow and an upper row of stacked convex-up gutters, was produced by a mobile deposit-feeder inhabiting shallow tiers because it is crossed by most other trace fossils. We show that the spotty appearance of the deposits is generated by a mixture of (1) dark, organic-rich shallow- and deep-tier traces (TOC = 0.16—0.36), and (2) light grey, organic-poor mottled or structurless sediment (TOC = 0.09—0.22). The higher TOC in shallow-tier burrows of Lamellaeichnus demonstrates that uppermost sediment layers were affected by poor redox cycling. Such conditions imply a limited mixed-layer depth and inefficient nutrient recycling conditioned by hypoxic bottom-waters, allowed by poor circulation and high sedimentation rates in depocenters of the Zliechov Basin. Hypoxic conditions are further supported by (1) dominance of trace-fossils produced by infaunal deposit feeders, (2) high abundance of hypoxia- tolerant agglutinated foraminifer Bathysiphon, and (3) high abundance of Chondrites with ~ 0.5 mm-sized branches. Oxygen-deficient bottom-conditions can thus simultaneously explain the rarity of benthic carbonate-producing macroinvertebrates and high standing abundance of tolerant soft-shell and agglutinated organisms in spotted deposits. Abstract: Single grains of detrital white mica from the lowermost Upper Cretaceous Sinaia Flysch have been dated using the 40Ar/39Ar technique. The Sinaia Flysch was deposited in a trench between the Danubian and Getic microcontinental pieces after the closure of the Severin oceanic tract. The Danubian basement is largely composed of a Panafrican/Cadomian basement in contrast to the Getic/Supragetic units with a Variscan-aged basement, allowing the distinction between these two blocks. Dating of detrital mica from the Sinaia Flysch resulted in predominantly Variscan ages (329 ± 3 and 288 ± 4 Ma), which prove the Getic/Supragetic source of the infill of the Sinaia Trench. Subordinate Late Permian (263 ± 8 and 255 ±10 Ma), Early Jurassic (185 ± 4 and 183 ± 3 Ma) and Late Jurassic/Early Cretaceous (149 ± 3 and 140 ± 3 Ma) ages as well as a single Cretaceous age (98 ± 4 Ma) are interpreted as representing the exposure of likely retrogressive low-grade metamorphic ductile shear zones of various ages. Ductile shear zones with similar 40Ar/39Ar white mica ages are known in the Getic/Supragetic units. The Cretaceous ages also show that Cretaceous metamorphic units were already subject to erosion during the deposition of the Sinaia Flysch. Abstract: This study presents zircon fission track data from the Bucovinian nappe stack (northern part of the Inner Eastern Carpathians, Rodna Mountains) and a neighbouring part of the Biharia nappe system (Preluca massif) in order to unravel the thermal history of the area and its structural evolution by integrating the fission track data with published data on the tectonic and sedimentary evolution of the area. The increase of metamorphic temperatures towards the SW detected by the zircon fission track data suggests SW-wards increasing tectonic overburden (up to at least 15 km) and hence top NE thrusting. 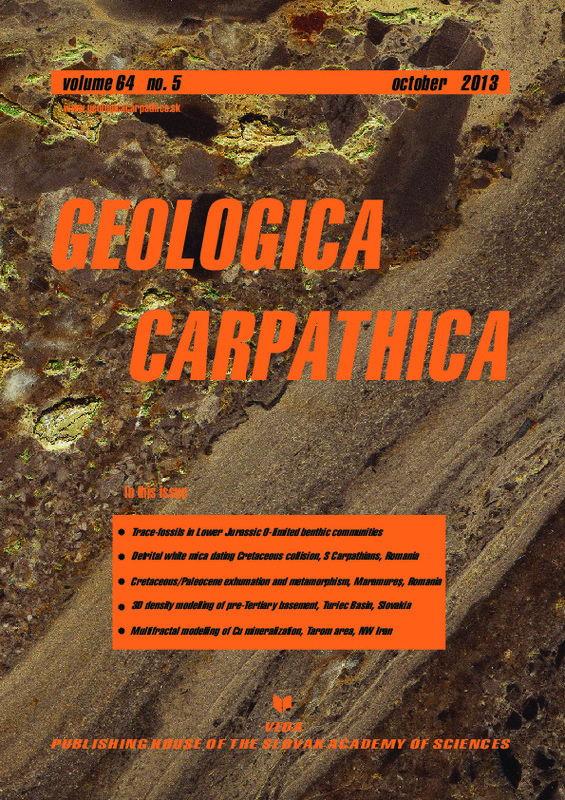 Sub-greenschist facies conditions during the Alpine metamorphic overprint only caused partial annealing of fission tracks in zircon in the external main chain of the Central Eastern Carpathians. Full annealing of zircon points to at least 300 °C in the more internal elements (Rodna Mountains and Preluca massif). The zircon fission track central and single grain ages largely reflect Late Cretaceous cooling and exhumation. A combination of fission track data and stratigraphic constraints points to predominantly tectonic differential exhumation by some 7—11 km, connected to massive Late Cretaceous extension not yet detected in the area. Later events such as the latest Cretaceous (“Laramian”) juxtaposition of the nappe pile with the internal Moldavides, causing exhumation by erosion, re-burial by sedimentation and tectonic loading during the Cenozoic had no impact on the zircon fission track data; unfortunately it prevented a study of the low temperature part of the Late Cretaceous exhumation history. Abstract: New results related to the thickness and density of the sedimentary fill of the Turiec Basin allowed us to construct the first original stripped gravity map for this typical intramontane Neogene depression of the Western Carpathians. The stripped gravity map of the Turiec Basin represents the Bouguer gravity anomalies corrected for the gravity effect of the density contrast of its Quaternary-Tertiary sedimentary basin fill. It means that the map reflects the gravity effects of the density inhomogeneities which are located beneath the sedimentary basin fill. This map is there- fore suitable for the interpretation of the structure and composition of the pre-Tertiary basement. Based on the new data analysis, two different density models of the sedimentary fill were constructed. The 3D density modelling was used to calculate the gravity effect of the density models. The stripped gravity maps were produced by subtracting the density model gravity effects from Bouguer anomalies. The regional trend was also removed from the stripped gravity maps. The residual stripped gravity maps were consequently used for geological interpretation of the pre-Tertiary basement of the Turiec Basin. The pre-Tertiary basement of the Turiec Basin can be divided into northern and southern parts due to its gravity characteristics. Furthermore the northern part can be split into two domains: western and eastern. The crys- talline basement of the western domain is probably formed by the Hercynian crystalline basement of the Tatric Unit. In the eastern domain the basement could consist mostly of the Mesozoic complexes of the Fatric Unit. The southern part of the pre-Tertiary basement of the Turiec Basin is built predominantly by Mesozoic complexes of the Hronic Unit. It is suggested that the Hronic Unit also forms the bedrock of the volcano-sedimentary complex of the Kremnické vrchy Mts. The resultant stripped gravity maps and the map of total horizontal gravity gradients have also proven to be very useful for the interpretation of faults or fault systems in the study area. Various faults, particularly of NNE-SSW and NW-SE directions were discovered. The analysis of the faults indicates clearly that the contact of the Turiec Basin with the Malá Fatra Mts and the Ve ká Fatra Mts is tectonic. Abstract: The Tarom 1 : 100,000 sheet is located within the Cenozoic Tarom-Hashtjin volcano-plutonic belt, NW Iran. Reconstruction of the tectonic and structural setting of the hydrothermal deposits is fundamental to predictive models of different ore deposits. Since fractal/multifractal modelling is an effective instrument for separation of geological and mineralized zones from background, therefore Concentration-Distance to Major Fault (C-DMF) fractal model and dis- tribution of Cu anomalies were used to classify Cu mineralizations according to their distance to major faults. Applica- tion of the C-DMF model for the classification of Cu mineralization in the Tarom 1 : 100,000 sheet reveals that the main copper mineralizations have a strong correlation with their distance to major faults in the area. The distances of known copper mineralizations having Cu values higher than 2.2 % to major faults are less than 10 km showing a positive correlation between Cu mineralization and tectonic events. Moreover, extreme and high Cu anomalies based on stream sediments and lithogeochemical data were identified by the Number-Size (N-S) fractal model. These anomalies have distances to major faults less than 10 km and validate the results derived via the C-DMF fractal model. The C-DMF fractal modelling can be utilized for the reconnaissance and prospecting of magmatic and hydrothermal deposits.